A food web in its simplest form is merely a diagrammatic or mathematical summary of the trophic interactions in a community: an indication of what eats what. This having been said, it remains noteworthy how many different ways authors have chosen to represent what they perceived as this 'simple' concept. The purpose of this short chapter is to illustrate the different ways in which I have chosen to represent phytotelm food webs. I have found it appropriate to use a range of forms of representation of food webs to illustrate different points or test different hypotheses. To insist on a single standard is to misplace emphasis on method rather than question. Nevertheless it has not always been made abundantly clear in food-web descriptions what the ground rules of construction have been: and I have been as guilty of this misdemeanour as others. Accordingly I lay out here sets of rules for constructing webs that are used in ensuing chapters. In addition the chapter introduces and defines a number of summarising statistics which may be extracted from food webs. Again I define only those quantities which I use subsequently: other authors have used other statistics. Parenthetically the chapter also introduces a food web from each class of phy-totelmata as a tool for explaining web construction and the extraction of the statistics. 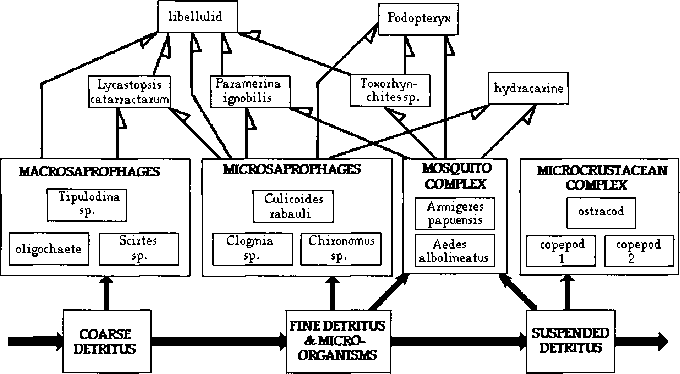 Figure 5.1 is a full representation of the metazoan food web, at the macro-organism level that I compiled for water-filled tree holes at Baiteta in lowland rainforest north-west of Madang in Papua New Guinea (Kitching 1990). Fig. 5.1. A full representation of the metazoan food web from water-filled tree holes at Baiteta, Madang, Papua New Guinea. interaction, however strong or weak, frequent or infrequent, is represented by an upwardly directed arrow between two species boxes, indicating flow of material in the direction of the arrow. In practice a number of decisions have been made, implicitly or explicitly, in constructing the diagram. The web was constructed during a six-week visit to the region during the wet season of 1987. During that time I searched the forest in the region for water-filled tree holes. Twenty-seven sites were encountered during this period. These sites were a combination of rot holes in tree stumps or broken branching points, or pans in the axils of branches and buttress roots. None was higher than four metres from the ground. Subsamples of the contents of each were obtained by dipping out the contents by hand, ladle and siphon. These were returned to the laboratory where they were sieved, sorted and counted. Unknown larvae were set up in rearing containers and emerging adults were collected, killed and mounted. Upon my return to Australia and over a period of years, these specimens were identified for me by a range of taxonomic specialists. • Only a limited number of sites over a limited period of time were examined. • Only low-level easily accessible sites were sampled. 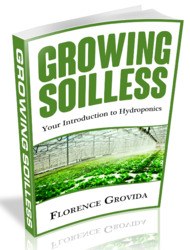 • Only larvae which could be separated to the species level were ennu-merated at that level. In other words 'chironomid midge larvae' might be counted but, after completion of the rearing process, turn out to be two or three species. There is then no way to go back and re-assign larvae to Species 1, 2 or 3. Various rules of thumb may be used but each carries further assumptions. • Only larvae which are reared successfully can be identified further, and this may restrict the accuracy of the resulting food web. Fig. 5.2. The food web from water-filled tree holes in Papua New Guinea as in Fig. 5.1 but drawn in 'aggregated' form. • assumed trophic links may change during development of the species concerned. As already discussed in the introductory chapter, the last two problems, of interaction strength and ontogenetic change, remain among the greatest challenges for further field research on food webs in phytotelmata. Problems associated with the identification of species-species feeding links can be reduced significantly by drawing the web in the aggregated form shown in Figure 5.2. Such a simplified web contains almost as much usable information as Figure 5.1 and most of the derived statistics can still be calculated. The exception to this is connectance, which needs information on the full set of species interactions for its calculation (see below). It must also be added that the food web from New Guinea tree holes is one of the most complex webs so far constructed for any phytotelm community. 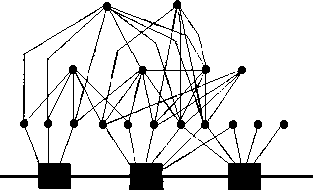 Most of the webs encountered are much simpler and can be constructed with less information, fewer assumptions and more confidence. One remaining problem arises at this stage of the investigative process. It has always been my experience that the occasional larva or other animal turns up in the sorting of organisms, particularly from larger phytotelmata such as tree holes, for which the question arises: 'Is this organism really to be considered part of the container food web, or is it merely an accidental?' Accidentals may occur, for instance, in drier tree holes where inhabitants of moist leaf litter become admixed with the sludge and water samples on which I base my food webs. To include them, without question, in food webs can make the webs unrealistically complex and can skew food-web statistics subsequently used in comparative analyses. Several considerations assist in making decisions as to whether to include a species in drawing up the food web, or not. Mere rareness, or even uniqueness within samples, is not in itself reason to exclude. For instance, as indicated in the preface to this part, in New Guinea two examples of the namanereine polychaete Lycastopsis catar-ractarum turned up in the samples. The first thought, that these were mere contaminants from neighbouring forest streams, was set aside after I learned that the only other known examples of this species were also from water-filled plant containers (see Annexe). More useful are some of the considerations discussed in the taxonomic accounts in Chapter 3 and the Annexe, in which some taxa can be considered as accidentals on the basis of the known biology of the groups concerned. For example, I occasionally find living Collembola in tree-hole and plant-axil samples. In general these are of terrestrial groups that occur commonly on tree bark and plant surfaces, in moss beds and leaf litter. I do not include these in the aquatic food webs that I construct. Ultimately though, there is a measure of judgement in decisions about inclusion and non-inclusion based on experience. The problems discussed here, of course, are diminished by larger sampler sizes, repeated visits to the same regions, and more intensive study of particular species - but these solutions are not always available. The two web representations so far discussed contain, within them, taxonomic designations and as such are necessarily complex and sometimes forbidding for the non-taxonomist. Often what is needed for a particular analysis is a summary of the structure of the web, indicating clearly the trophic linkages and the number of species at each trophic level but not concerning itself with the identity of the species themselves. 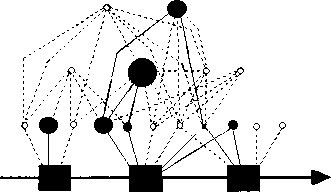 Figure 5.3 is such a representation and is what I call a 'graphed' version of the web (because those who approach food-web analysis from the point of view of graph theory tend to draw their webs in this fashion - see, for example, Cohen 1978). A minor variation upon this form is to number the nodes and provide a key naming the species involved (as in Figures 5.7 and 5.9). Fig. 5.3. A 'graphed' form of food-web representation of the Papua New Guinea tree-hole food web presented in Fig. 5.1. Fig. 5.4. 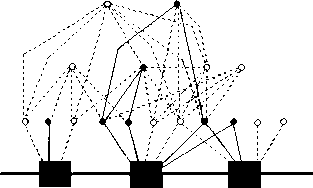 A graphed food web from a single habitat unit with the complete regional web 'ghosted' in the background, based on the Guinea tree-hole web presented in Fig. 5.1.
area. This mode of represention is particularly useful for summarising local spatial and temporal variation in food web structure (e.g. Kitching 1987a, Kitching & Beaver 1990), often used in conjunction with the final mode of food-web representation that I shall describe here. Fig. 5.5. A food web with the relative abundance of the participating organisms represented by different sized symbols. In this case the four sizes of solid symbols representing nodes indicate the presence of a particular species, the size of the symbol, the log abundance quartile for that species (across all habitat units in the region). predators are now available but have not been applied, hereto, to any phy-totelm webs (although these present ideal situations for the application of these methods). Figure 5.5 represents a compromise solution to this problem in which the range of abundance values in the data set are divided into quartiles (usually after logarithmic transformation) and their presence in the food webs within particular phytotelm units is then represented by a symbol, the size of which reflects the abundance quartile observed for the subject species within that habitat unit. This circumvents the problem that, for instance, the range of abundances observed for midge larvae or ostracods are of a different order of magnitude than those observed for tipulids or odonates. The device of dividing observed abundance ranges into quartiles standardises across such organisms. Figure 5.6 is an example of webs constructed in this fashion for data from bamboo internodes collected in Sulawesi and previously presented in Kitching & Beaver (1990). Dividing the observed range of densities into quartiles is arbitrary. The range could be divided into fives or sixes or whatever ranges that the investigator chooses and that the inherent accuracy (or otherwise) of the data will bear. Fig. 5.6. A set of food webs from individual bamboo cups from northern Sulawesi, constructed in the manner of Fig. 5.5 (from Kitching & Beaver 1990). habitat units, providing a useful index of web similarity for some purposes (see, for example, Kitching 1987a). Figures 5.7 to 5.10 represent examples of full metazoan webs from bromeli-ads, bamboo internodes, pitcher plants and axil waters. Figures 5.1 to 5.5, presented earlier, cover the case of water-filled tree holes in this context. Fig. 5.7. 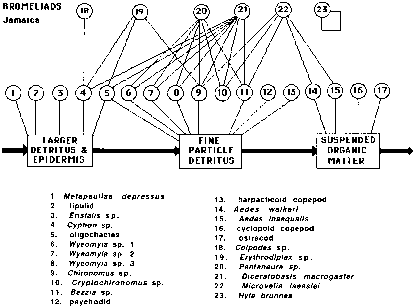 A food web constructed to represent the aquatic fauna of water-holding bromeliads from Jamaica (constructed from information in Laessle 1961). 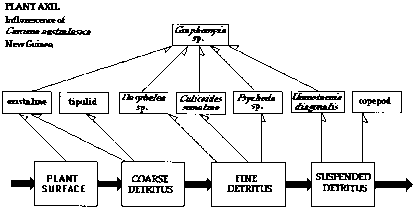 the 'labelled' graph form because of the great number of species involved. The faunistic aspects of Laessle's study revolved around the destructive sampling of twenty bromeliad plants in the Chestervale region of eastern Jamaica. Both micro- and macro-organisms were sampled and distributed for critical identification. The food web as I have drawn it is restricted to the metazoans, excluding rotifers, gastrotrichs and nematodes. Other than these I omitted a few very occasional or uncertain records mentioned by Laessle, and restricted myself to clearly aquatic species. 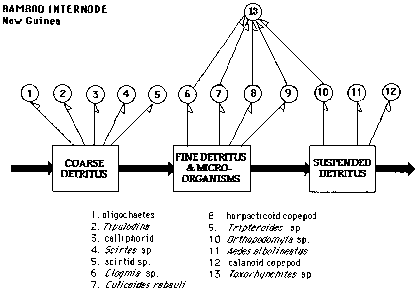 In general I included those trophic links identified or inferred by Laessle (1961) himself but added a few more (such as that linking the anisopteran dragonfly larvae with the oligochaetes, for instance) on general principles (see taxon accounts). Figure 5.8 represents the aquatic web found in pitchers of N. albomarginata from Penang Hill, Pulan Pinang, West Malaysia. This representation is based on that of the work of Beaver and his colleagues (Beaver 1979a, b, 1985; Kitching & Beaver 1990). The figure omits the araneid species Misumenops for present purposes because of its largely terrestrial habits. Fig. 5.8. The food web from pitchers of Nepenthes albomarginata in West Malaysia (after Beaver 1979a, 1985). Bamboo internodes present woody, if monocotyledonous, containers, the full faunas of which have been seldom studied (see Table 2.4). Where appropriate comparisons have been made it emerges that bamboo food webs display considerable overlap with co-occurring tree-hole webs. Figure 5.9 summarises information based on my studies of the fauna in northern New Guinea in the environs of Madang (Kitching 1990). The web is based on surveys of the fauna of twenty-six water-filled internodes sampled by sawing off the bamboo stump below the last complete nodal plate and emptying the contents completely. The fauna of water-filled axils formed by leaves or bracts has often been sampled but the full range, even of metazoan, organisms found within them has seldom been examined (see Table 2.5). Fig. 5.10. The food web from the water-filled bract axils of Curcuma australasica, from Madang, Papua New Guinea (from Kitching 1990). data on which the web is based were collected around the town of Madang during 1988. Twenty-six spikes of the plant were sampled by cutting below the water-holding section and inverting the whole into a plastic bag. 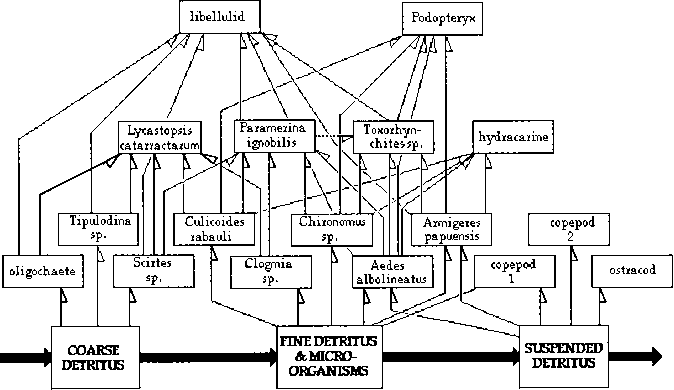 Separate studies on the successional changes that occur in these food webs were made and are presented, inter alia, in Chapter 10. There are a great number of ways in which food-web data of the sort described above can be summarised and rearranged for comparative purposes, some simple and some complex. I have always used the simpler measures and I present here the statistics I have used and use in this work. I include even the most obvious, not as a slur on the reader's intelligence, but by way of laying unequivocal ground rules for what follows. It is surprising how frequently, in the literature, different statistics have been presented under the guise of equivalence (see, for example, Cohen 1978, Jeffries & Lawton 1985, Closs 1991). The various statistics I allude to are summarised in Tables 5.1 and 5.2. Table 5.1 presents most of these as they may be extracted from the five webs illustrated earlier in this chapter. Table 5.2 contains the 'summary statistics' (see below) associated with the web from water-filled tree holes in New Guinea. What trophic level is a pitcher plants?